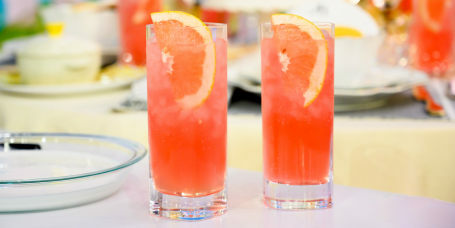 Fresh grapefruit juice and sweet gingerale combine with sanbitter for a refreshingly bubbly mocktail. 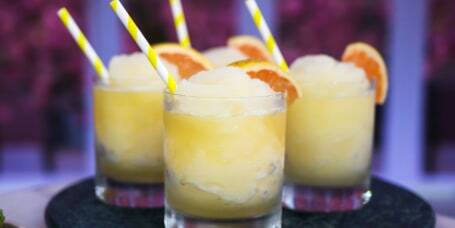 Make frosty cocktails quick and easy with frozen fruit juice ice cubes. Dress up Champagne with zesty lemon, gin and sweet syrup for an easy-to-make special occasion cocktail. 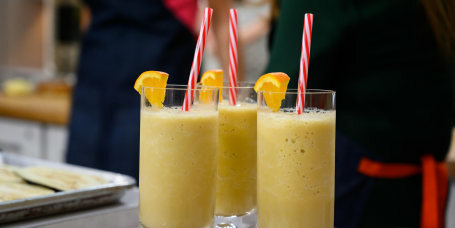 Oranges, bananas and mango come together to make a fresh and fruity breakfast smoothie. 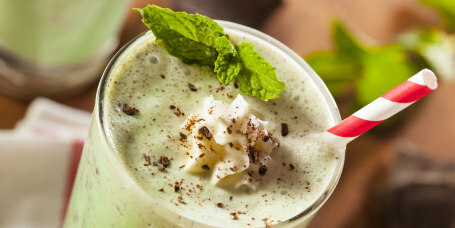 Can't decide between a delicious drink and a decadent dessert? Enjoy both! 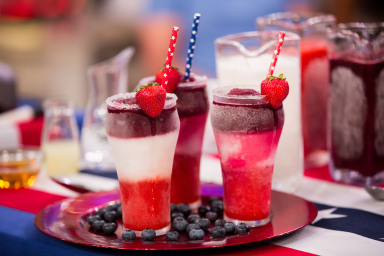 South Carolina gets pretty hot, so we created a refreshing drink to help people cool off after any meal. 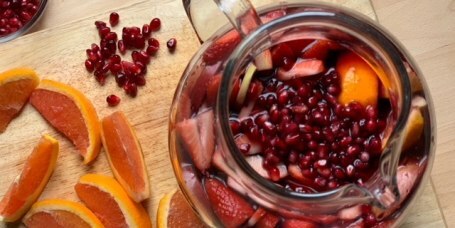 Tart pomegranate juice and fresh fruit make Joy Bauer's no-added-sugar sangria fun and flavorful. 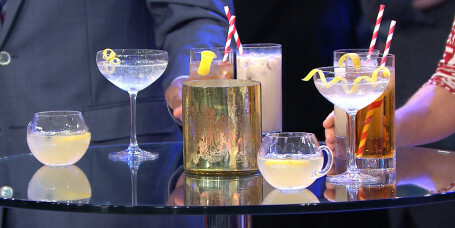 Customize this classic French 75 cocktail recipe with a variety of different liqueurs. 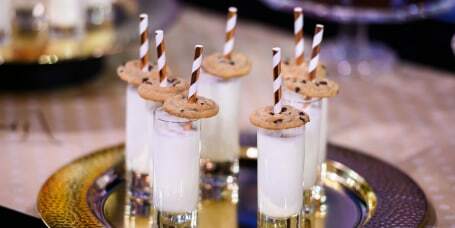 The classic combo of milk and cookies is an easy party dessert that will make everyone feel like a kid again. 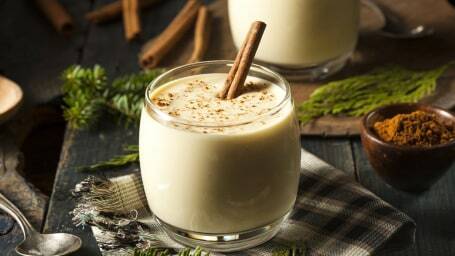 Make eggnog extra special with the addition of maple syrup and rye whiskey. 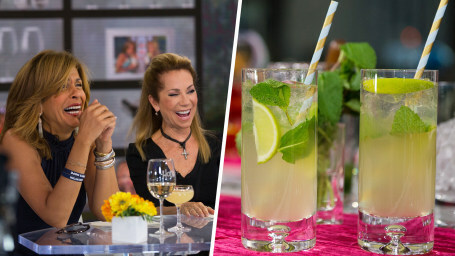 Carson Daly shares his family's recipe for a classic Brandy Alexander cocktail. 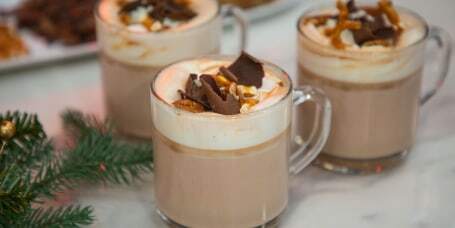 This reindeer tracks hot chocolate recipe will delight the whole family. 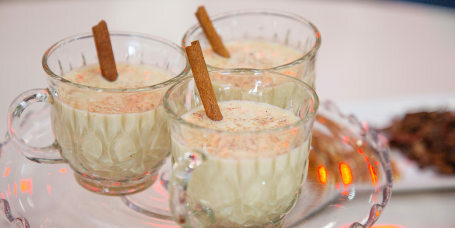 This holiday cider glogg recipe is perfect for Christmas and other holidays. 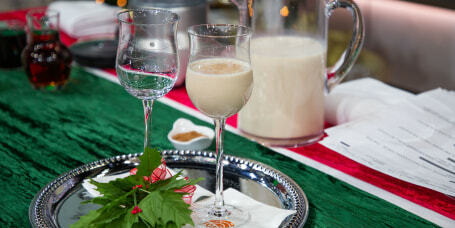 Cut the calories and fat this Christmas with this lightened up eggnog recipe from nutrition guru Joy Bauer. Bone broth provides a nourishing base for this delicious, antioxidant-rich smoothie. 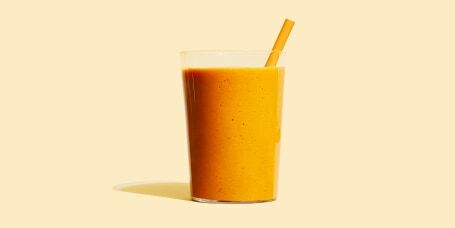 This nourishing smoothie from Brodo is a delicious way to incorporate protein into your beverage routine. 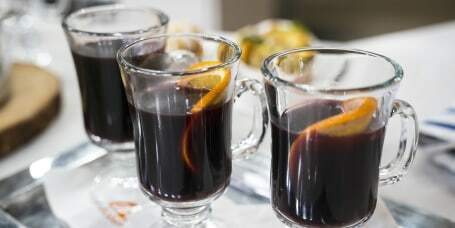 Infuse red wine with zesty citrus, warm spices and dried fruit for an easy fall cocktail. Fresh rosemary, candied ginger and sweet apples give Moscow mule cocktails a sweet and spiced autumn twist. 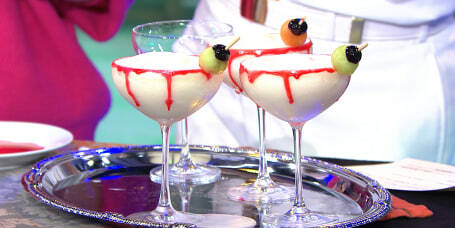 Keep an eye on — and in — your cocktail with piña coladas topped with cherry-stuffed lychee eyeballs. 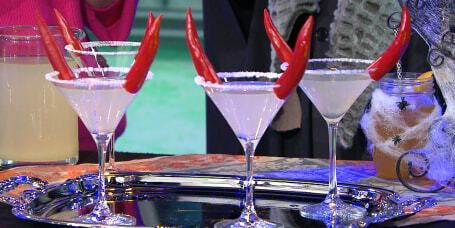 Transform regular margaritas into spicy sippers with hot chile peppers for a devilish Halloween drink. 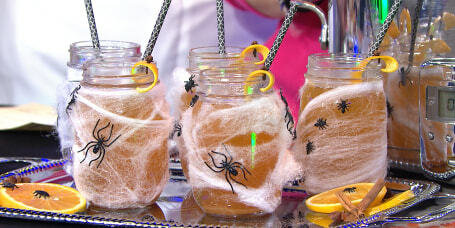 Warm up Halloween party guests with spiced apple and whiskey crock-pot cocktails. 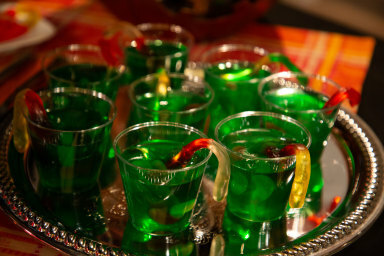 These adorable shooters are perfect for kids and adults at any Halloween bash. 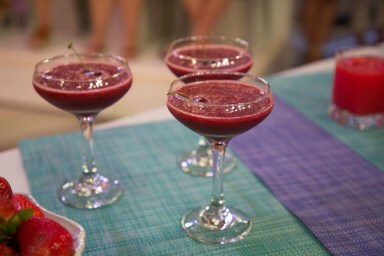 Classic daiquiri cocktails are easy to make in batches for simple serving at parties. 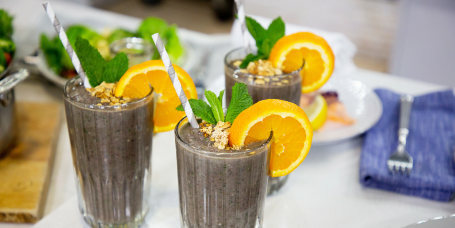 Pack your morning smoothie with veggies, fruits, seeds, granola and fresh herbs for a great start to the day. 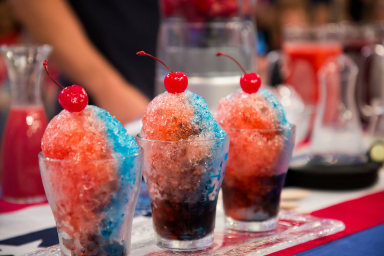 Serve brightly-colored candy slushies in five awesome flavors for a festive Halloween drink. 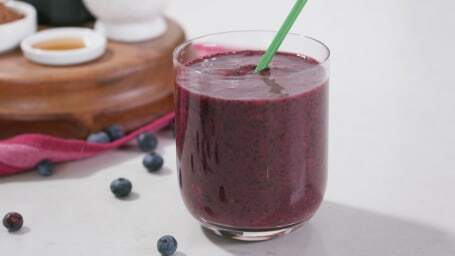 This bright and colorful smoothie is as nutritious as it is flavorful. 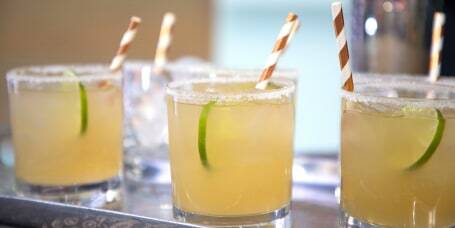 Celebrate the best of sweet summer flavors with this tea-infused margarita. It's a tangy and flavorful crowd pleaser. 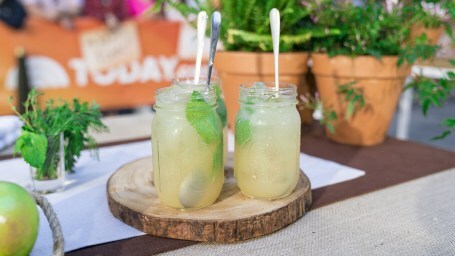 Charred pineapple and mezcal add smooth, smoky flavor to sweet sangria. For a delightfully cool summer drink, cherries and pineapple are all it takes to bring out the sweetness in your favorite bottle of rosé. 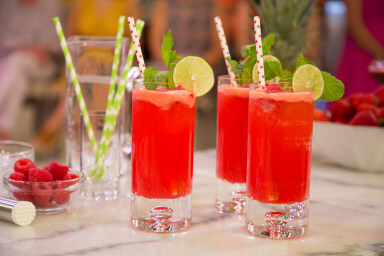 Mint, raspberries and lime make this drink deliciously refreshing during the hot summer months. 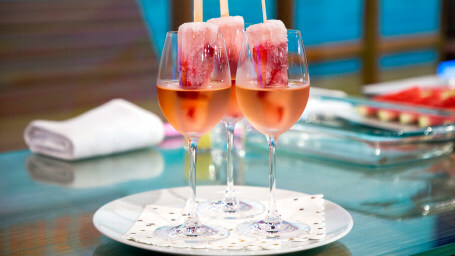 Turn bubbly champagne into festive strawberry-infused popsicles that are perfect for any summer party. 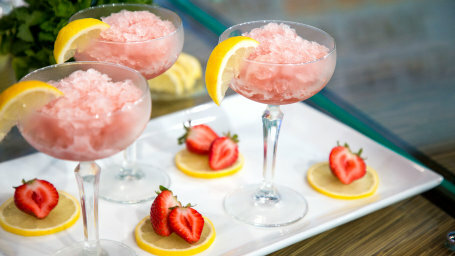 Turn rosé wine into a frosty summer treat just a little sugar, zesty lemon and the freezer. 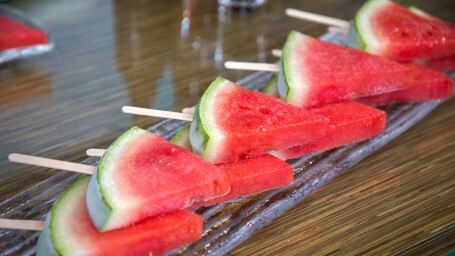 Watermelon gets a grown-up soak in booze and a roll through sweet sugar in this easy 5-ingredient party recipe. 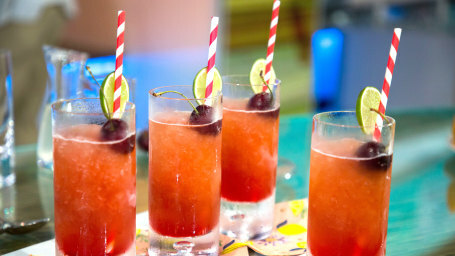 Refreshing cherry-lime Ricky meets cool beer shandy in this frosty summer cocktail recipe. 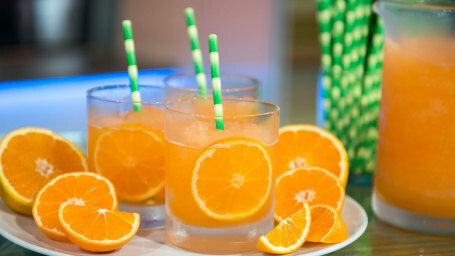 Easy Aperol spritz cocktails get a refreshingly chilly makeover for summertime sipping. It's the ultimate summer refresher. 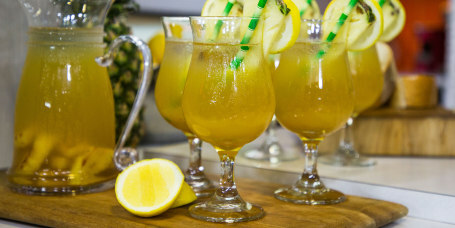 Sunny lemons and fresh ginger turn bubbly prosecco into a refreshing cocktail perfect for any summer get together. 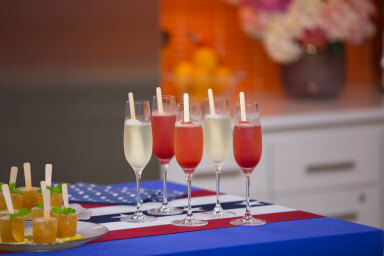 Bubbly prosecco and cold popsicles combine to make the perfect cooling and fizzy summer cocktail. 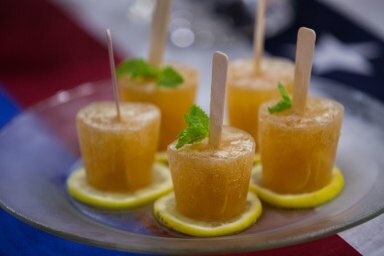 Make refreshing grown-up popsicles with sweet Southern tea, fresh mint and bourbon. 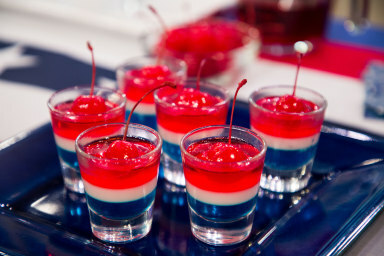 This drink is colorful and loaded with flavor. 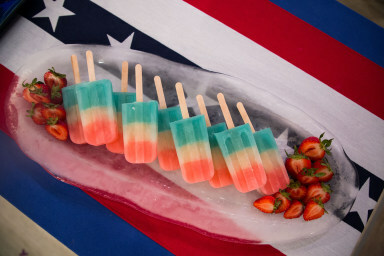 These are so easy to make, and add a summery kick to any gathering. Sparks will fly with these fun shots. Try this adult version of a kiddie favorite.